Game #28 & #29 Cole vs Cole and the debut of Jeremy Hellickson in split squad games! The pitchers in the photo above are the current clubhouse leaders in ERA (sort of). It is hard to compare apples to apples because Fedde has done most of his work in relief and is actually tied with Tommy Milone in ERA at 2.45. This also goes to the constant discussion of process versus results. Tonight, Jeremy Hellickson makes his Nationals debut in a split squad game versus the Marlins in Jupiter, and A.J. Cole appears in a game of Cole vs. Cole which seems like a divorce headline although this is against Gerrit Cole in a matchup in the FITTEAM Ballpark of the Palm Beaches tonight. Don’t fret, if you have more than one device you can watch both games as MASN is broadcasting Cole’s game and FOX is broadcasting Hellickson’s debut game in Jupiter. 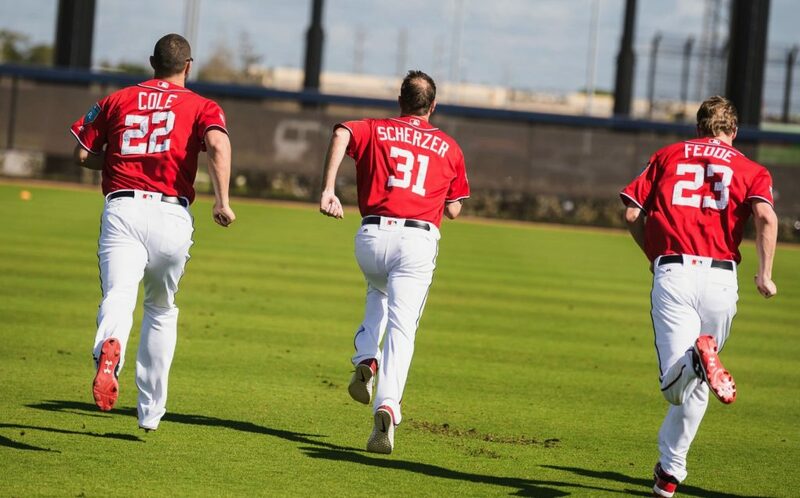 All winter, Nationals fans have wondered who would emerge as the 5th starter even after assurances from Mike Rizzo to season ticket holders that it was A.J. Cole. In the end, it really does seem to be Cole vs. Cole with A.J. against himself. If A.J. Cole shines in the spotlight, he could entrench himself into the rotation before Hellickson is deemed ready and tougher decisions will need to be made. When camp breaks, Cole will be the 5th starter possibly until the former Rookie of the Year, Jeremy Hellickson, tries to show he deserves the spot. Did anyone really believe that Mike Rizzo was not going to add a starter? Well, many thought it was going to be Jake Arrieta, and in the end, Hellickson was the one signed. He is not the same pitcher statistically that he was when Dave Martinez was his bench coach in Tampa. Those were the days when Hellickson was looking like an ace and in 2011 only trailed James Shields for the team’s ERA crown and finished at 2.95 but was at 5.17 in 2013. Somewhere it unraveled and Hellickson has been a pitcher who has lacked consistency on the mound. Some days he looks like an ace while other days he looks ready for a DFA. Hellickson has a birthday in 2 weeks when he will turn 31, and the kid who grew up in Iowa near the Field of Dreams is now dreaming of another chance. “It’s just a good opportunity with a great team,” Hellickson said about signing with the Nationals. “It’s something that I couldn’t really pass up. They just wanted me to come in, watch me and then go from there. Hellickson seems to be pitching on a reputation of what he once was and it finally caught up with him as there were no takers until the Nationals came calling last weekend to sign him to a minor league deal with a May 1st opt-out. The Nationals have until then to promote him or risk having him leave as a free agent. This will be an on-going situation and this try-out begins in earnest tonight. Luckily for Hellickson, he won’t be facing Giancarlo Stanton, Christian Yellich, Dee Gordon, Marcel Ozuna or even Martin Prado who is injured. He will be facing a watered-down Marlins line-up with few names that will scare a starting pitcher. This is why Hellickson is getting the start in Jupiter and not against the potent Houston Astros line-up who A.J. Cole will have to face featuring Carlos Correa, Alex Bregman, George Springer, and Jose Altuve just to name a few.